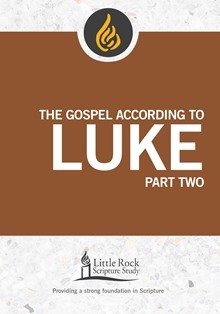 The Gospel of Luke demonstrates the universal nature of Jesus' mission. In Part Two of this study (Luke 12:1—24:53), readers travel with Jesus from the region of Galilee to the city of Jerusalem, where Jesus will enter into his passion and resurrection. Luke's focus on God's faithfulness will encourage you to trust. Commentary, study and reflection questions, prayers and access to recorded lectures are included. 5 sessions. Michael F. Patella, OSB, SSD, is professor of New Testament at the School of Theology at Saint John's University in Collegeville, Minnesota. He is the author of Angels and Demons: A Christian Primer of the Spiritual World and Word and Image: The Hermeneutics of The Saint John's Bible (Liturgical Press). He is a contributor to The Bible Today and Give Us This Day published by Liturgical Press. Each lesson provides a suggested opening and closing prayer, the text of the gospel, and a fine commentary by biblical scholar Michael Patella, OSB, along with study questions. An excellent and practical resource.